Views of New Jersey and Liberty Island from the top of the highest building in New York - the Empire State Building. The magnificent views from the now highest building in new York, the Empire State building, are really stunning und well worth the waiting and the entraince fee connected with that experience. 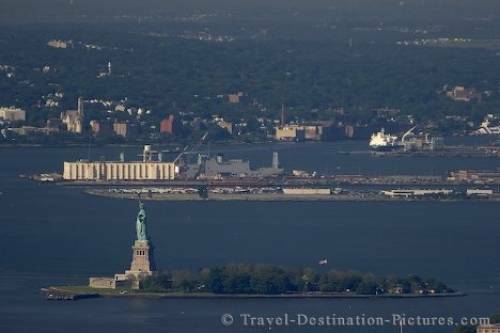 On clear days the view goes out to liberty Island and Ellis Island and to the southern tip of the manhattan peninsula. New Jersey in the background, New York, USA.